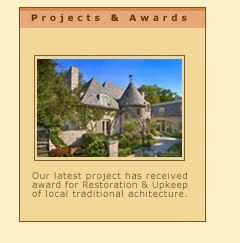 July 2006 - Award for Restoration & Upkeep. which consist of 100 shades of shingles was matched by crafty hands. Waffle ceilings were transferred and extended into new addition. Kitchen walls were redone and matched to original wood.